One of the many great things that I like about the buy/write strategy is that it doesn’t matter if your shares are going up or going down… either way, there is potential to make more money. This effectively removes almost all of the anxiety/frustration that I used to feel when I would see my shares start to fall. The frustration is now replaced with happy feelings of potentially doubling income on my premiums. So, from now on, it’s buy/writing every single time! This position management opportunity arises when share value declines causing option premium to meet our 20%/10% guidelines in the first half of a contract. Short calls are closed and re-sold if and when share value recovers. From a chart perspective, we will see a classic V-shaped pattern where stock price declines and then rises. ***For more information on covered call writing exit strategies, see the “exit strategy” chapters in both versions of The Complete Encyclopedia for Covered Call Writing. For our covered call writing or put-selling portfolios, we select our underlyings based on fundamental, technical and common-sense analysis. Then we check the option chains to make sure the premium can generate initial time value returns that meet our goals. Assuming all requirements meet our goals, the stock is included in our monthly portfolio. Now, buying a stock and waiting for share appreciation is adding additional risk to a conservative strategy. Any security can be brought down by a declining market. If that occurs, time value returns may now not meet our goals. Or we may have to use a lower strike, locking in a loss on the stock side. If share price rises, we win but is the risk worth it? 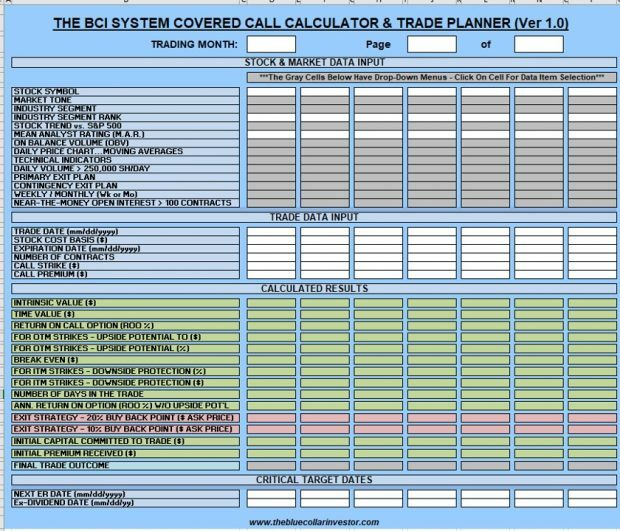 The BCI guideline for buying a stock specifically for covered call writing is to buy the stock and sell the option simultaneously (buy stock and then immediately sell the option or use a buy/write combination form). At this point, we have successfully established our initial time value return goals and move to management mode where we look to mitigate losses and enhance gains. 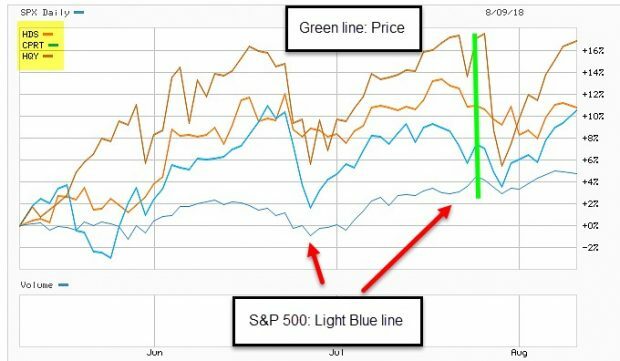 If there is a group of stocks that we like for long-term growth, we can establish a separate portfolio outside our option-selling accounts. I started employing the covered call writing strategy you teach in the 2nd quarter of last year. I have already realized some nice returns by employing this strategy. I finished 2018 at 4.6% on my main IRA. I thought that was decent compared to S&P being down 6-7%. Thanks for all you do for all of us do-it-your-selfers! BCI: I am favoring out-of-the-money strikes 2-to-1 compared to in-the-money strikes. Earnings season has been a positive with a favorable jobs report and market volatility has subsided dramatically. The 6-month charts point to an improving market tone. In the past six months, the S&P 500 down 4% while the VIX (16.14) moved up by 23%. We can’t forget that the VIX was more than double the current rating on December 24th (36.07). I was reading your Strike Price Selection a Critical covered call decision web paper. If you sell an ITM covered call will you be assigned as soon as you make the trade? No, that will not happen. The option premium for ITM strikes has 2 components: Time Value + Intrinsic Value. The intrinsic value is the amount the strike is below (in-the-money) the current market value. This amount is not initial profit but does represent downside protection of the initial time value profit. The remaining premium is time value or initial profit. If the option holder (buyer) exercises as soon as we sell the ITM strike, intrinsic value will be captured and time value lost. The option holder is better off selling the option. Let’s say we sell the $30.00 strike for a stock trading at $32.00 and receive a premium of $3.00 per share. The premium consists of $2.00 intrinsic value and $1.00 time value. Should the option holder exercise, there will be a benefit of $2.00 (buy stock at $30.00 and sell for $32.00). Or, the option holder can sell the option for $3.00. The choice is obvious. Most options will not be exercised until expiration of the contracts. I am a true believer in the BCI methodology, and have been following the guidelines very strictly. Also, most of my trades are buy a stock in the first week of the options cycle, and immediately sell the monthly CCs. one more thing : If the bid/ask spread is small, I do Buy/write at market value, but, since the comissions are almost insignificant, I normally buy the stock first and try to get an advantage by negotiating a more favorable price. As soon as I get a fill, I immediately sell the CC options at the best price possibble too. Now: I have chosen the best stocks from the BCI weekly watch list, plus some other wonderful companies from other sources, but the market is tottaly oblivious of my smart choices, and some stocks simply go down. Now it is time for strategies and tough decisions. So, do you wait, and hope for an opportunity to hit a “double”? Maybe yes. Depends on the specific situation. In my opinion, better cut your losses early, and get out of Dodge. When the trade is losing more than 1.5%, I pull the plug. There are always other stocks. with good possibilities. My rule is “Feed your winners, and get rid the losers” ( as picked up from the old book Marketing Warfare). If you Buy a covered call with a combination order you are negotiating the best and smallest debit limit order, which in turn, reduces the cash balance the least at that instant in time for the two variables (stock and option premium). By separating the two and getting the best bid/ask for the stock and option separately, you are essentially doing a buy / wait with a short time difference between the two. In fact, while you are negotiating the option Sell order (now a credit limit order), if the long market price of the stock has gone down, you are receiving a smaller credit premium and that reduces your cash position. If you are actually waiting to get a better bid price, which tracks the stock price (unless volatility makes a play) then you are doing a buy / wait. Another advantage, at least for me, is the commission charged for the order for my Fidelity orders. Etrade: In a combination order, Etrade charges for each leg separately the base commission of 4.95 plus $0.50 per contract. So minimum for a covered call is 4.95+4.95 plus 0.50 = 10.40. That is 0.2% per share ($0.10). That for the Initial trade. The other factor is the time spent on the orders. Since I have tried to be 92% diversified in my 5 accounts, time is a factor for me. I usually have placed the same order in 4 of the 5 accounts in parallell, and negotiated for the best combination order. Once you fill one of the accounts (playing the bid/ask), I can usually change the value of the orders for the other accounts and they fill. It is good you are trying various strategies. We are all doing that. You learning a lot with each experience. I have tried long position only, buy wait strategies. Also thinking of new strategies in the future which will lower my risk and be content with lower returns. The comments from our other members as to how they mix their strategies are welcome. The market is a casino and gets back at you at most unexpected moment and fate also makes a play. Getting out early is an interesting option, and perhaps that is a good strategy nowadays since everything rolls together nowadays, greatly affecting your total investment position. If only certain stocks of your supposedly diversified portfolio decline, you can afford to use the 20/10% rule, then hold the long position for a recovery. I have found over many trades that at the 20% point, that Stock purchase price at the point is down 4% to 8%. I am not happy when I experience the 8%. I unwind at that point that is a lost of $1600 on a 20000, investment (less $400 for a 2% option credit). The net $1200 loss, is several option orders in the future if you just average 2%.. So you need to rely on a mix if OTM (higher ROO%), ITM and other exit strategies (MCU, rolling opportunities,etc.) in our mix to end up winning overall and make up. It was a good feeling to make 24% and 16% in the market for 2016, and 2017. Now we are in a challenging period. I can afford to take a wait and see attitude to recover on some long positions I have (ETF only in my case per my latest strategy). Glad to see the recent bullish tones in the market. your observation of a premium drop during the time of execution of my trades is very pertinent, and has acasionally happened to me. Yes, it really becomes a buy/wait. Therefore I try to be fast to minimize this potential issue. The problem with outright buy/writes is the additional complication of the calculation for the limit offer, especially when I am trading more than one contract. Also, I feel that I have more bargaining power when doing separate hagling. (probably not true). My broker Schwab base comission on trades is similar to your Fidelity price policy. The 20/10 guideline has worked well for me in past years, but after the recent correction, my risk tollerance has gone way down. The 8% paper losses involved are far above my limit these days. This week’s Weekly Stock Screen And Watch List has been uploaded to The Blue Collar Investor premium member site and is available for download in the “Reports” section. Look for the report dated 02/01/19. I came across this article about option closing strategies. Would be very interested to get your opinion on this. This is very different from what i have read in your books but it may just be written with a different perspective. Not as clearly understood as your strategy. This article is geared to call buyers, not covered call writers. In the article a stock is trading at $70.70 at expiration and the (purchased) $65.00 call is quoted at $5.20, below the intrinsic value of $5.70, the amount a long call holder would expect to generate. This scenario is extremely rare, but possible, assumes arbitrage not working and involves shorting stocks. Bottom line: it does not apply us. Our goal is to generate initial time value premium and any share appreciation up to the strike if an out-of-the-money strike was selected. When the strike is expiring in-the-money…mission accomplished. Now, if we are considering rolling the option (to the next contract month or week), an option trading for less than intrinsic value only benefits us. At least as of this date, these 3 stocks, HQY, CPRT, and HDS, lack sufficient options liquidity to be considered for a covered call trade. Glad you brought this up so I can point out to new subscribers that open interest (liquidity) is defined as adequate or inadequate in the 3rd column from the right in our reports. 1. Liquidity may change during the contract. 2. Many subscribers use our stock list for buy and sell decisions without the option component. ZBRA has confirmed ER for 02/14. Better get rid of my 02/15 trade. If selling CCs is a great thing, isn’t selling cash secured puts even better? you get to buy stocks you always wanted at a discount? maybe the premium earned will be smaller than for CCs but then after being assigned you can sell CCs. Both are great strategies…all 3 really…covered call writing, selling cash-secured puts and the PCP strategy (using both). Each individual investor must select from this list which will provide opportunities to beat the market significantly and consistently. I prefer covered call writing in normal to bull markets because we have the opportunity to generate additional profits from share appreciation (using out-of-the-money strikes). Put-selling profits are limited to the put premium. See pages 21 – 22 of my book, “Selling Cash-Secured Puts” for a comprehensive list of the pros and cons of put-selling. You can’t go wrong with any of these 3 strategies. IS IT POSSIBLE FOR ME ON A $ 25,000. INVESTMENT IN LEAP’S TO MAKE 70% OF $ 8,036.OR AM I WRONG? I TOOK $ 25,000. DIVIDED IT BY 5 AND HAD $ 10,000. PER TRADE AND I BOUGHT THE FOLLOWING ETF LEAP’S AT JAN. 15 2021 80 DELTA 5 XLI,4 XLY,15 XLF, 12 XLP,2 QQQ, IN ORDER TO FIGURE MY PROFIT I WENT TO THE MAR. 1 2019 ONE DEVIATION OUT OF THE MONEY AND MULTIPLIED THAT PRICE BY THE NUMBER OF SHARES IN EACH OF THE ABOVE ETF’S AND THAT’S HOW I GOT THE $ 8,036. HOW WRONG WAS I? You are describing “The Poor Man’s Covered Call” (PMCC) strategy where LEAPS options are purchased in lieu of shares of stock or ETFs and then short-term, out-of-the-money calls are sold against those long positions. Based on your stats of premiums of $8,036.00 against a cost-basis of $25,000.00, the initial 1-month returns compute to 3.2%. This completely reasonable. Select Market to buy or sell a security at the prevailing market price when the order is eligible for execution. Select Net Debit, which involves the amount of money per share that you will pay from your account when the order fills. You will need to specify this amount in the Price field that appears, and this does not include commissions. Select Net Credit, which involves the amount of money per share coming into your account when the order fills. You will need to specify this amount in the Price field that appears, and this does not include commissions. Select Even, which involves no money moving in or out of your account as a result of the order and does not include commissions. Is a Net Debit the same as a limited order for covered call writing? I got a feeling etrade is muscling out profits for the little guy/ in this case…the little gal from the Bronx you sent two free books to. I’m retiring this year and plan to trade covered calls for the rest of my days. It is a no stress work environment. I have complex post traumatic stress disorder, so no to low stress is all I can manage these days. Good to hear from you again. You made my day learning of your investment success with our BCI methodology. With the choices you describe, “net credit” seems like the one that you want since selling an option will result in cash coming into your account. Be sure to read the “Show or Fill Rule” section of my books before entering credit amounts. Thank you for the continued mentorship. The fact that you take the time to personally respond to email is amazing. I appreciate you, the knowledge you’ve shared, the BCI Methodology and your service to our country as a dentist, and as a teacher to our fellow blue-collar investors. I hope to do what you have done. I’m looking at acquiring my first property in 2019 in NYC thanks to the over 100K that I have accumulated in the last three years using the BCI Methodology. Thank you Alan. I have recommended your products to quite a few people overseas and I hope they have been smart enough to look into it. Thank you again. E-Trade has been agressive in growing their business through acquisitions and bought Options House (my broker) not long ago also. 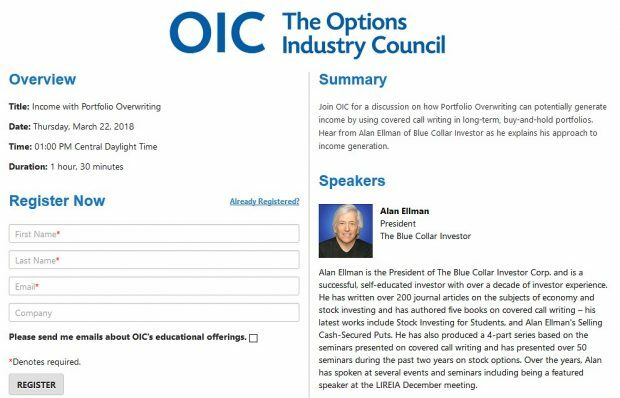 They retained the Options House platform which I find very easy to use for any type options trading. They call it “power E-Trade” now. I assume you are are on “E-Trade Pro” platform? Maybe you can ask them to switch your platform and give the other one a try? They’ll likely say it’s reserved for legacy Options House accounts but it may be worth asking? I have been with E-trade for longer than I can remember. I use neither Power E-Trade nor E-Trade Pro. I use their basic platform. This platform has worked fine for me. If I wished to move to Power E-Trade they have some very good tutorials and have offered me personal tutoring on the platform. They are very high on it and I expect that over time they will only have that as their platform. Claire, what you are describing sounds like you were placing a buy/write order. I use that from time to time. It’s a little complicated on the surface but really is a way to buy a stock and sell an option at the same time and give you a way to place a limit order on both the stock and the option. For example; You want to purchase 100 shares of ABC. The bid is $30.00 and the ask is $30.50. You wish to sell 1 contract at the $31.00 strike. The ask is $1.00 and the bid is $0.90. You wish to place an order half way between bid and ask on both. Since you are buying the stock and selling an option for less than you are paying for the stock you will have a net debit to your account. Using the example prices above you wish to place an order mid way between the bid and ask on both the stock and the option. In this case $30.25 for the stock and $0.95 for the option. $30.25-$0.95=$29.30. So $29.30 with be your net debit. Once you enter this number E-trade will then show you your commission fee and your total cost. In this case your commission would be $4.95 + $4.95 + $0.50 = $10.40. total cost will be $2930.00 +$10.40 = $2940.40. My experience is that a buy/write takes longer to execute and some times the prices move too quickly to get an execution. The execution also could be for a different stock purchase price and a different option sales price still netting $20.30. For example paying $30.30 for the stock and getting $1.00 for the option, or conversely paying $30.20 for the stock and getting $0.90 for the option. I hope this is not too confusing. I usually place two different orders, one for the stock and a second immediately following for the option. This is what some of our bloggers call buy/wait. 🙂 In my case not waiting too long. The second order usually executes about two minutes after the first. Hope this helps. Sorry to be so long winded. This week’s ETF Report has been uploaded to your premium site and is available in the “ETF Reports” section. Look for the report dated 2-6-2019. ***This weekend’s Stock report will be published later than usual due to seminar commitments and flight availability. We expect the report will be uploaded to the member site on Monday although every effort will be made to have it available sooner.